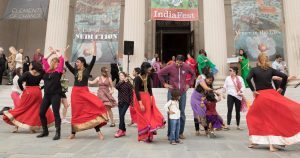 Following their performance at the 2017 India Fest, members of the Dance It Off troupe invited NOMA visitors to try Bollywood dancing. In the popular imagination, India brings to mind visions of the majesty of the Taj Mahal, exotic wildlife ranging from peacocks and Bengal tigers to indigenous elephants, tantalizing foods of innumerable spice combinations, and brightly-colored fashion that enthralls the eye. In recent years, India’s imprint on the world has increasingly been spread by way of its prolific film industry, commonly known as Bollywood. On Friday, February 8, as part of a special Night of India festival from 5 – 9 pm, NOMA will welcome Dance It Off, a Bollywood-style dance troupe of Indian-American women from metro New Orleans. The troupe’s spokesperson, Sri Murali, spoke with NOMA Magazine about the group’s shared passion for dance. What is the origin of Bollywood dancing? The Bollywood film industry was born in pre-independence India. India is a pretty young country, about 62 years since independence from the British. The Indian film industry was modeled after Hollywood, hence the name Bollywood. The “B” stands for Bombay, which was the pre-independence name for Mumbai, where the movie studios are located. When sound was introduced to motion pictures, the directors wanted to include music and dance to enhance the audience experience. So the first Bollywood-style movies were born in the 1930s, and since then music and dance have become integral ingredients of Indian movies. How did your dance troupe get started? We are a group that consists of working professional women, all wearing different hats—doctors, nurses, physicians, dentists, teachers, investment bankers who share a passion for dance. Between caring for our families, raising our children, and juggling busy schedules, we all missed dancing which was an integral part of our youth. Asha Abraham, a healthcare case manager, and a common friend to several ladies in our group gathered us together—three of us at first, then five, and now we are a group of twelve. Our passion for dance brought us together initially, but now it is the strong bonds of friendship that keep us together. We are not looking to make money. We dance for non-profit events and for charitable organizations. Dance allows us to express ourselves, and at the same time it gives us the opportunity to support some great causes and organizations. It seems that our group literally grew in numbers overnight and we are slowly beginning to gain recognition as a Bollywood dance group in Louisiana. We hope to get an Instagram site set up this year, but we need to determine who within the group has the time to dedicate to social media. What distinguishes Bollywood dancing from other dance styles? Bollywood dance is very easy on the eye because it combines various dance forms, such as Bombora, Bharatanatyam, and Kuchipudi. These are all traditional dance forms in India from various states. The purpose of Bollywood is storytelling. The dances, like the movies, tell a story, and send a message out. The dance routine walks you through different emotions. Bollywood dancing can go by movie script, but it can also stand alone. At NOMA we’ll be performing upbeat feel-good musical numbers. But we have other themed dances we have performed at other venues, including a recent dance-drama that explores the journey of a woman, her emotions and the various roles she plays and responsibilities she has within her family and society. Bollywood dancing will take place at 6 and 7 pm. For the full lineup of Friday Nights at NOMA programming on February 8, visit this link. Indian cinema dates back to 1913 and the first-ever Indian feature film, Raja Harishchandra, by producer Dadasaheb Phalke, the first movie mogul on the subcontinent. He oversaw the production of 23 films between 1913 and 1918. The motion picture industry began to skyrocket in the ensuing decades—from 108 movies in 1927, to 328 in 1931. Imported Hollywood films also played well to Indian audiences, and the lavish musicals of the 1930s and ’40s became an inspiration for filmmakers. The 1960s saw the emergence of a New Wave of Indian filmmaking, with directors such as Bimal Roy, Satjayit Ray, Mrinal Sen, and Ritwik Ghatak crafting critically acclaimed social-realism movies that focused on the plight of the working class. Another genre of films, which came to be known as Masala movies—referring to the culinary term for a mix of spices—provided pure escapism through a pastiche of action, comedy, and melodrama, lavishly punctuated with at least six song-and-dance numbers. This style defines most of Bollywood’s output today. The word Bollywood was coined in the 1970s by a journalist in Mumbai. American pop stars like Madonna, Shakira, and Britney Spears have incorporated the Bollywood style of dance or music into their songs, videos, and stage shows. Likewise, Bollywood choreography has increasingly been influenced by Western music and dance styles. In modern Bollywood films, dance numbers are often based on jazz, cabaret, disco, Latin, or hip-hop music. Owing to the large number of films made and the millions of avid moviegoers in India, Bollywood far outpaces Hollywood in production output and box office numbers. According to Forbes magazine, 1.36 billion tickets were sold worldwide for Hollywood films in 2012 compared to Bollywood’s whopping 2.6 billion. Indian films can’t match Hollywood in box office revenue, however. U.S. films grossed nearly $10.8 billion in 2012 compared to India’s $1.6 billion. Watch a range of clips from popular Bollywood dance scenes in this video.